Later in the year, Siffert returned with a Porsche 917PA, an open topped (Spyder) version of the recently developed 917 endurance racer. The 917 had a complex aluminum-tube space frame chassis and was powered by an air cooled, 4.5-liter flat-12 engine. It was heavy and under-powered compared to the 7-liter Chevys prevalent in the Can-Am. Siffert’s best finish was a third, but he did finish fourth in the Can-Am championship after only racing two thirds of the season. In 1970, Siffert again drove a factory entered endurance Porsche in the Watkins Glen Can-Am. This time he scored an amazing second place finish in a 917K coupe. The only Porsche regular in the Can-Am, however, was Dean in his little 3-liter 908. It may not have been fast, but it was reliable. This was proven at Road Atlanta when he gave Porsche their first Can-Am victory. This win broke Team McLaren’s 19 race win streak. Dean finished sixth in the championship. There were three Porsches regularly driven in the 1971 Can-Am — the 908 of Frank Matich, the 917PA (ex-Siffert car) entered by Vasek Polak for Milt Minter, and the 917/10 of Jo Siffert. The endurance Porsches also put in their appearance at Watkins Glen (for the last time), but the best finisher was Gijs van Lennep in ninth. Siffert’s 917/10 had the same wheelbase as the 971PA, but the body was shorter and had fins on each side of the rear bodywork. Engine size was 5- liters when introduced (a third of the way into the season), but up to 5.4-liters by the end of the season. Just before its first race, Siffert signed a sponsorship contract with STP. They couldn’t come up with any day-glo red paint (STP’s racing colors) in time to paint the car for the race, but they did find contact paper in the proper color with which to cover the car. Siffert scored several top-5 finishes, including two seconds, to finish fourth in the championship. Unfortunately, he was killed in a Formula One race before the season ended. Minter finished sixth in the championship. 1972 saw the face of the Can-Am change with the introduction of Porsche’s new 917/10K. Fitted with twin-turbocharged, 5-liter flat-12 engines, the factory supported, L&M cigarette sponsored, Roger Penske prepared 917/10Ks of Mark Donohue and George Follmer won six of nine races. Donohue missed four races because of injuries suffered in a testing accident, so Follmer was brought in as a substitute driver. After Donohue returned, Penske entered cars for both drivers. Follmer accounted for five of the six Porsche wins and was rewarded with the Can-Am championship. Several other drivers raced 917PAs or 917/10s, but not of the configuration of the Penske cars. Had the 5-liter turbocharged flat-12 not worked out, Porsche had built a normally aspirated 7.2-liter flat-16 motor. Though tested, it was never raced. It was never needed, as the turbo motors produced 1000 hp on the dyno and 900 hp in race trim. The body of the 917/10K was slab-sided with a wing mounted between fins on the rear bodywork. The bodywork directly in front of the front wheels, was concave, instead of the normal convex shape, to help produce downforce. The 917/10K could go from 0-60 mph in 2.1 seconds, 0-100 mph in 3.9 seconds, and 0-200 mph in 13.4 seconds! Their race performance was so awesome that they were called the Porsche “Panzers”. Porsche won all eight races in 1973. Charlie Kemp and George Follmer won the first two races in 917/10Ks before Donohue and the 917/30 got their act together and won six in a row and the championship. This was the first time that anyone had won six straight Can-Am races. For 1974, the Sports Car Club of America, partially because of the OPEC oil crisis ans partially because of the dominance of the turbocharged Porsche engines, introduced a fuel consumption formula of three miles per gallon. Porsche pulled out of the Can-Am. The only Porsche regulars during the five race season were a couple of old 908s. 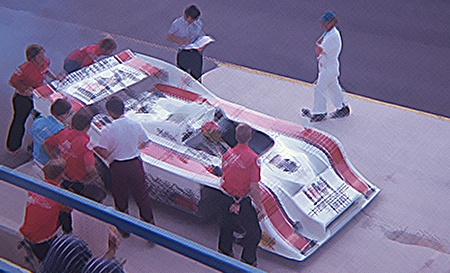 The 917/30 made one appearance in 1974, at the Mid-Ohio Can-Am. Reasons varied from the official story that this was the track at which it got the best gas mileage, to a rumor that the promoters would not rigidly enforce the gas mileage rules in an effort to increase interest in the dying series. Brian Redman started the car on pole but finished second. The 917/30 made one last run before being retired to a museum and occasional historic racing duty. On August 9, 1975, Donohue drove it at the Talladega superspeedway to a World Closed Course Speed Record of 221.120 mph. It had run 250 mph on the straights.